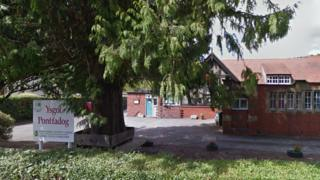 A village primary school which is closing could be given to the community which fought to keep it open. Lessons end at Ysgol Pontfadog in the Ceiriog Valley this summer after a last-ditch legal bid to save it failed. Wrexham councillors decided to close the English-medium primary school at an emotionally-charged meeting in August. It came despite more than 1,300 objections against the plan to send pupils to the dual-language Ysgol Cynddelw two miles away. The closure is expected to save Wrexham County Borough Council almost £100,000, according to the Local Democracy Reporting Service. The authority said demand for English-medium education was falling, but campaigners disputed that, claiming most families in the area spoke English rather than Welsh. Despite a four-and-a-half hour court hearing in Cardiff last month, a challenge against the closure was unsuccessful. Glyntraian Community Council, which took part in the campaign to save the school, will now consult local residents about options for the future use of the building. It said that following a meeting, senior Wrexham councillors had indicated they were "willing to consider gifting the school and grounds to the local community in the long-term". A public meeting about the future of the building be held at the school on 11 April. Wrexham council has been approached for comment.